Satellite data indicates that the plane was in the air seven hours after it took off from Kuala Lumpur—and 30 minutes after it was scheduled to land in China. Malaysian officials announced Saturday what many people already suspected: Malaysia Airlines Flight 370 was hijacked or somehow deliberately steered off course after the plane's communication systems were disabled. Malaysian Prime Minister Najib Razak said Saturday that the plane bound for China was still flying at 8:11 AM, about seven hours after it took off from Kuala Lumpur and about half an hour after it was expected to land in Beijing. This last data point, from a satellite trying to communicate with the plane, indicates that the 777 was still in the air when it might have been running dangerously low on fuel, raising the possibility that a possible hijacking might have ended with a crash. The precise location of the flight at 8:11 AM is still a mystery. 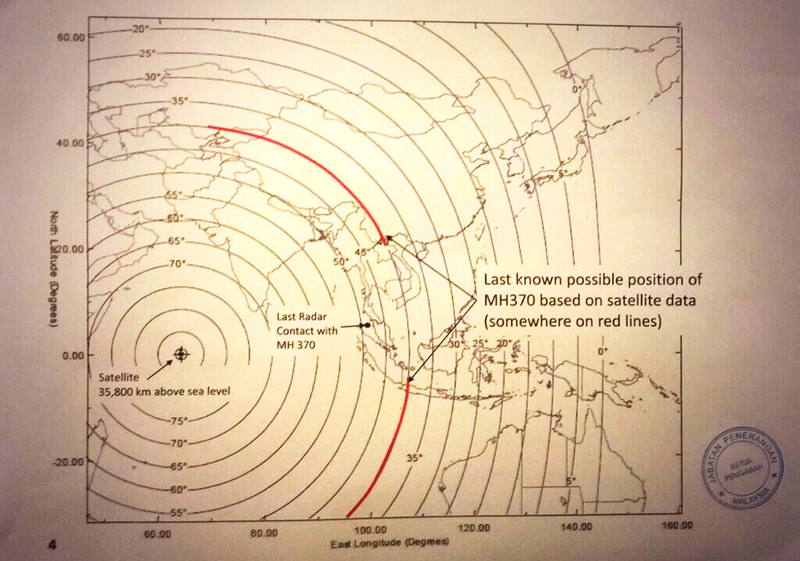 But officials provided a map (above) that shows the plane's possible location along one of two red semi-circles, based on a "ping" from a satellite orbiting 35,800 kilometers above the Indian Ocean. As you can see, this final data point indicates two possible flight paths: one northwest stretching toward Kazakhstan and another southwest into the Indian Ocean. 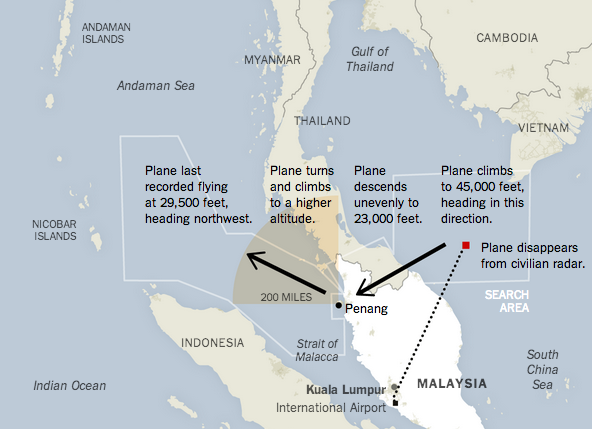 The northern flight path is above land, which would raise the odds that officials find the plane or its remnants. But The New York Times points out that it's unlikely that air-defense networks in India, Pakistan, or Afghanistan failed to pick up on a rogue 777. This makes the southern path more likely. Bloomberg's analysis of the last satellite "ping" tracked the plane's last known location to about 1,000 miles west of Perth, Australia. Today the search-and-rescue mission became a criminal investigation into the backgrounds of the crew and passengers. Malaysian officials reportedly left the house of one of the pilots carrying small bags. To review the basics of what we've known so far according to civilian and military radar: The flight took off from Kuala Lumpur, climbed to 45,000 feet around the South China Sea (above the regular altitude limit for a 777), sharply descended around the time its communications systems were turned off, and was last recorded heading west, in the opposite direction from its Beijing destination. This New York Times graph is a good summary.